Mint Hinged. Everything Included is Shown. No Hidden Faults. No: 63056 - BRITISH GUIANA (1966) - "ELIZABETH" - LOT OF 13 OLD STAMPS - MNH!!
! British Guiana 1913-1917. Stamp. YT#123. €30.00 ! 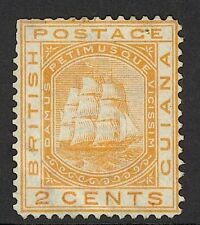 SG 122 British Guiana 1862. Very fine used CAT £1000. 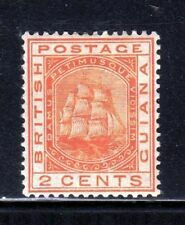 Early issues of British Guiana include a number of major rarities, among them "The World's Most Valuable Stamp," the 1¢ black on magenta of 1856. Fine mounted (hinged) mint. (SG Cat - £238). 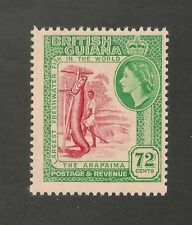 Very early rare stamp British Guiana cigarette card. African tobacco co. Very good condition. Scarce card. NO RESERVE. EDW1949SELL : BRITISH GUIANA 1938-54 Sc #230-41, 253-67 Both Cplt sets Cat $107. BRITISH GUIANA. Both Complete sets. Very Fine, Used. a pretty image. These are distinguished by both shade and a large perforation tooth on the bottom right and left hand vertical perfs. Both the 4c shades are included but I am uncertain of the 12c, so this is excluded from the catalogue value. 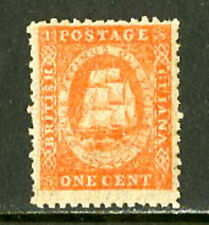 SG 49 Mauritius 1860-63. 6d green, no WMK, perf 14. Very fine used with ‘7’ (grand bay) obliteration CAT £170. Slight annul G.P.O. GEORGETOWN. arrive annul TORINO, dated 26 - 1 - 1958. sent from GEORGETOWN to TORINO (Italy). 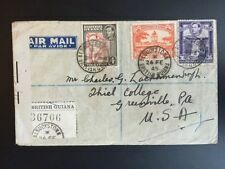 dated 21 - 1 - 1958. cover, cm. dated 22 JA '58. This outstanding collection ranges from 1860 to the 1950s. British Guiana 1961 QEII 48c bright ultramarine & pale brown-lake MNH. SG 341ab. British Guiana 1954-63 QEII Complete set SG 331-345 Mnh. 1954-63 QEII Complete set. British Guiana. SG 331-345. Pristine never hinged set. Well centered and fresh. 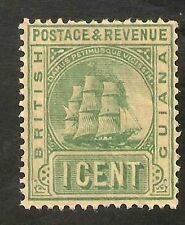 SG 117 British Guiana 1862. Fine used CAT £1000.